The decision to push construction of the Sheppard LRT out to the 2020s was taken quite recently as shown by two separate reports. According to Mr. Del Duca, the delay on Sheppard was because of the difficulty of trying to do too many big projects at once. 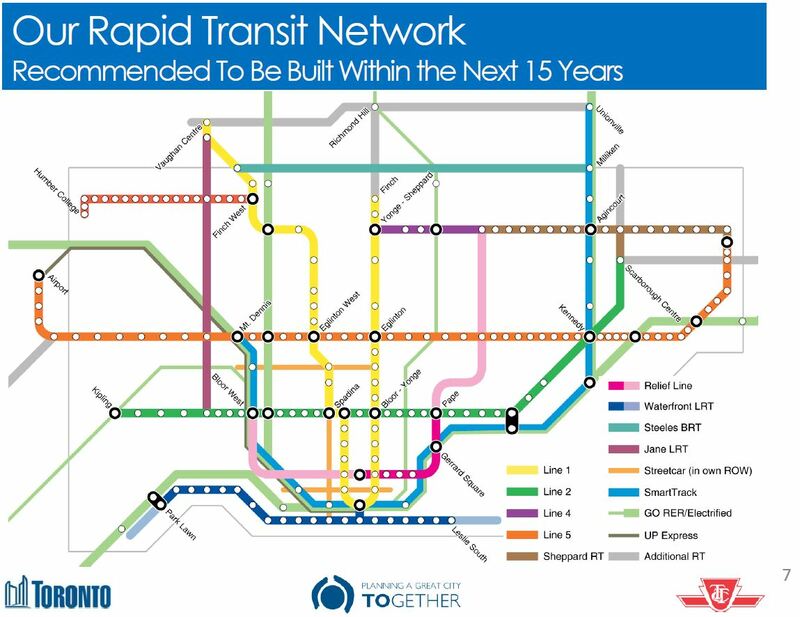 “The plan right now is to have the procurement begin for the Sheppard East LRT after we complete the Finch West LRT,” he said. There was no firm timeline available for the Sheppard line. If it starts on its new schedule and takes about as long as Finch to build, it should be ready some time after 2025. This timeline is sharply at odds with the information given to a reporter in the provincial budget lock-up on Thursday. The government’s position then – given on background and not for attribution, under the rules of the lock-up – was that the Sheppard line would open about a year after Finch. Mr. Del Duca’s spokesman did not return a message Monday seeking clarification of what had changed. Thank you for contacting us about the status of the Sheppard East LRT. The Sheppard East LRT is fully funded and approved. The Sheppard East LRT underpass construction at Agincourt GO Station has been completed. Preliminary design and engineering work will be happening over the next few years. Construction is expected to begin in 2017 and be completed by 2021. I appreciate you taking the time to contact us. One wonders just what triggered a change so last-minute that it was not communicated to Metrolinx’ own “communications” team. The Minister claims that the delay is because there is only so much construction work that can be undertaken concurrently, but this seems to have more to do with avoiding a politically difficult decision. A much more honest position would be to say simply that “we’re waiting for the results of various studies now underway on transit for Scarborough”, but leadership, or even a bit of common sense on anything transit-related in that part of town seems to escape the Liberals at Queen’s Park. The City of Toronto’s Planning Department is consulting with the public for the development of an updated Official Plan. The plan’s transportation component falls under the rubric of “Feeling Congested” with a website devoted mainly to transit issues. In the first round of meetings, the focus was on “what is important”, what goals should the new plan try to achieve. In the second round, the topic is the prioritization of goals and how these might drive out different choices in a future network. This parallels work that Metrolinx is doing on their Big Move plan, but it includes additional options for study that are city initiatives such as transit to serve the waterfront. Even with this background, an exercise asking whether the methodology is sound seems to be an odd way to survey public attitudes without a stronger discussion of the implications for a preferred network. This is rather like discussing the colour of a magician’s hat rather than the effect this might have on the rabbit he pulls out of it (or if there’s even a rabbit at all).